India's exports jumped in May but it may be a little too early to celebrate. Belying fears that a strengthening rupee will adversely impact India's competitiveness in the global market, the country's export growth has accelerated to a seven-month high in May. Shipments rose 12.4 per cent to almost $28 billion for the second month of the current fiscal year from $24.91 billion a year earlier, according to commerce ministry data. Growth was led by higher shipments of petroleum products and engineering goods. Imports fell 11.41 per cent, due mainly to a sharp 71 per cent drop in gold purchases. The data will likely ease concerns, at least in the short term, that the rupee's recent gains will hurt exports. The local currency has gained nearly 13 per cent against the US dollar since touching a record low near 69 in August last year. The rupee is currently trading around 59.7 to a dollar. Biswajit Dhar, former director general of Research and Information System for Developing Countries, a think tank under the Ministry of External Affairs, says the export growth can be linked to the base effect. 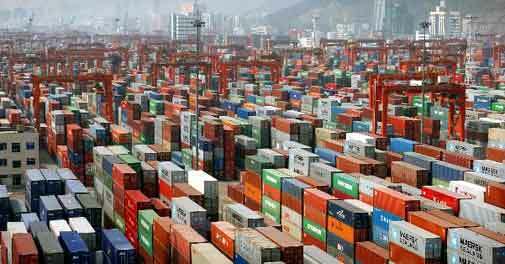 In May last year, exports had declined by more than one per cent. "The growth, however, will create positive sentiments in the economy with its impact on the current account deficit," says Dhar, who is also a professor at Jawaharlal Nehru University. But the base effect is not the sole reason for the high growth. This is because shipments in May were nearly nine per cent higher compared with April's exports of $25.63 billion. The base effect will likely help the country post handsome export growth in June as well, as shipments in June 2013 had declined 4.56 per cent. The long-term growth trend, however, will be clearer from July onwards because shipments had started growing in double digits after a sharp weakening in the rupee in July and August last year made Indian exporters more competitive. "As the unfavourable base kicks in July onwards, annual growth readings are expected to moderate," says a YES Bank report released after the trade data was announced. "However, given the upside potential that global growth recovery is likely to offer, the sequential momentum would still be positive for Indian shipments."